Space That Sees belongs to Turrell's "Skyspace" series, begun in the late 1960s and early 1970s, which can be seen as performance pieces responding to and interacting with environmental conditions and atmospheric fluctuations over time. Observing the shifting hues of the sky from inside a pristine, rectilinear space, viewers experience a connection to their surroundings. But more than that, the artist, by confronting us with the empty space, turns our mind to our own mode of seeing. For his Jerusalem Skyspace, Turrell chose a semicircular terrace along the western slope of the Art Garden. The site was cut in two and dug out, so that the terrace now enfolds a shrine-like inner space evoking places of worship such as pyramids, mausoleums, or temples. A square opening cut into its ceiling makes a frame for an ever-changing abstract "picture" of the sky, recalling by contrast Baroque illusionist ceilings crowded with painted clouds, saints, and angels. Space That Sees invites a kind of meditative experience. Twilight conditions yield a particularly startling effect, with the flat surface of the sky turning almost imperceptibly from deep blue to velvet black while the room itself seems to grow increasingly brighter, so that the physical conjunction at the roof opening of interior and exterior becomes a catalyst in the light's passage from day to night. 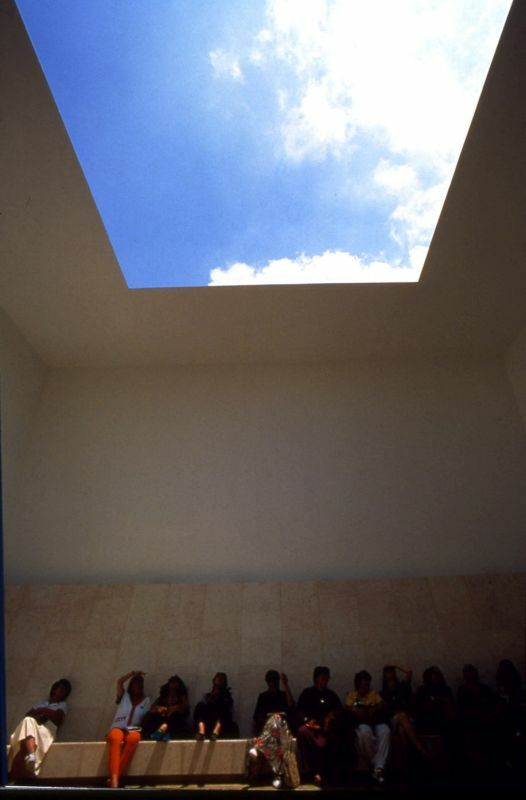 Turrell saw the installation as an "allegory of light that we generate from inside and light that comes from outside: the emergence into space where light comes forth as in a dream."